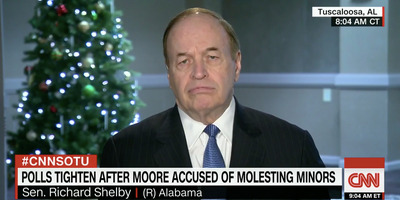 CNNAlabama Sen. Richard Shelby on CNN. Sen. Richard Shelby explained on Sunday why he didn’t vote for Roy Moore. The senior US Senator from Alabama said he wrote in another Republican, but refused to disclose the Republican’s name. Republican Sen. Richard Shelby of Alabama spoke out against GOP candidate Roy Moore in an interview just two days before the special election to fill the state’s US senate seat. In an interview on CNN’s “State of the Union” Sunday, Shelby explained that he did not vote for Moore and instead voted for an unnamed Republican write-in, citing the numerous accusations that Moore engaged in sexual misconduct with teenage girls. “I couldn’t vote for Roy Moore, I didn’t vote for Roy Moore, but I wrote in a distinguished Republican name, and I think a lot of people could do that,” Shelby said. “I think the Republican party can do better,” he added at the end of the interview. Shelby said the he believed the women who have accused the GOP Senate nominee, noting that there was “a lot of smoke, gotta be some fire somewhere,” but understood why President Donald Trump was continuing to back Moore. Shelby, who supported Sen. Luther Strange in the Alabama Republican primary, previously suggested that Moore should consider dropping out, joining a number of Senate Republicans who have opposed Moore’s candidacy since reports revealed the former judge’s history of alleged repeated sexual misconduct. The Senator’s comments came just days before the election that recent polls show is a virtual toss up. Moore has denied all of the accusations, painting the women’s stories as a liberal smear campaign. A number of national Democrats have descended on Alabama in recent days to hit the trail for Moore’s opponent, Doug Jones, a former US attorney. The special election is on Tuesday.